My family and I just returned from what is becoming our annual road trip to my homeland of Kansas. Because a piece for this column would be due while we were in the midst of the vacation, I intended to keep a journal of any esoteric-related dynamics that seemed to call to me while traveling. I was hoping to have a ready-made article by the time it was due. Alas, it didn't go that way at all, but some things did gel together. The Road Trip is interesting to me not only because I really enjoy it, but also for its unique archetypal qualities, fully developed and powerful despite the relatively short time auto travel has been around. The Road Trip is arguably the archetype that represents postmodern America. It's loaded. An updated, specific version of the Hero's Journey, the Road Trip (and its components, such as the Car Chase) is explored in film as a device and genre. Also, it can be seen to mirror the historical American notions regarding the search for identity and place (the pioneers, Westward expansion, Manifest Destiny.) The Road Trip archetype has even played out in real life events, such as OJ Simpson's Bronco Chase. Like any good archetype, the components involved in the myth construction are also found to be highly meaningful and there is a lot of reflexivity at hand. One of these components is the foundational substance--highway itself. Although it might be more inclusive to term it Road, after consideration, I feel like the specific term Highway really does seem appropriate. Highways are found in the in-between places, and on the outskirts of what we have designated as true destinations. They are the routes we travel on as we cross borders and go through passageways, giving our tokens and showing the right symbols, being granted admittance. The internal car-on-highway experience is somewhat ritualized as well; there are songs to be sung (99 bottles of beer, anyone?) and games to be played—miniaturized, magnetic versions of regular, normal-sized counterparts, which are in turn made more ‘real' somehow, by the altered travel editions. If you've ever played the travel version of Battleship, well, you probably know that it is decidedly more ‘unreal' than the normal game, which is already purposefully highly unreal itself. Highways are interstitial, a limbo, where the ideas of the real/unreal quite easily blend into each other. It's no wonder then, that liminal things take place in such a forum. Highways legends, like cemetery legends, are plentiful. There are some more subtle issues I noticed on and immediately after our road trip. Our favorite place to stop along I-70 is in Cambridge City, Indiana—the Amish Cheese Shop. I can barely describe its fabulous wonder. There are tons of locally made fresh cheeses, canned relishes, jams, sauces, baked goods—all available for sampling. We always take a cooler to transport the goods we buy to make it the rest of the journey, coming and going. The place is right off the highway exit, and complementing our post Amish Cheese Shop reverie, we spied an odd billboard immediately after the highway onramp. It was an "empty" billboard, advertising the space. 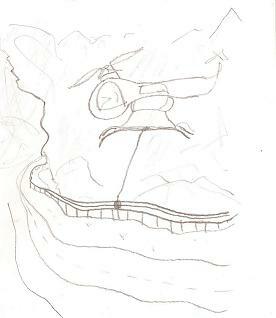 It featured a cartoonish UFO. I scrambled for my camera, but wasn't quick enough, and didn't get a shot. On the way back, my son was able to get a pretty good one from the back window. At first, it seemed like a silly, random appropriation of a cheap piece of clip art, likely a straightforward pun on the word "space" in the ad's text. But thinking about it further, I can't think of a more appropriate icon to accompany that sign. 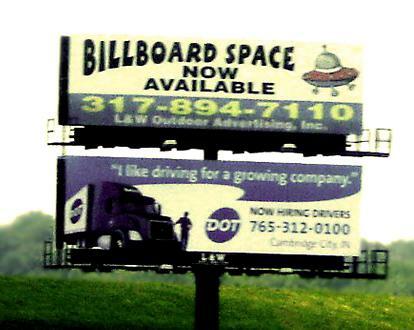 UFOs are prominent vehicles of liminal space, and seem fitting for both the physical area of the highway and the idea of emptiness/availability/option for change that the billboard was promoting. Like I mentioned before, highways are a notorious place for liminal, supernatural, and unexplained encounters, as there are many legends associated with it, including urban legends such as the disappearing hitchhiker, many "White Lady" and other ghost stories, and some of the most famous and compelling UFO encounters. However, it seems to also be a place of quite a number of more common accounts of everyday weird experiences. My husband has a monthly feature at his website called Your True Tales. To help him with a bit of the workload, I've started making some minor copy edits on these stories. My task includes reading all the many stories that come in, many of which aren't published. The overwhelming majority of these true stories take place at night, in bed. While that doesn't automatically exclude them for publication or discount the paranormal reasons for the events described, there's a strong possibility that sleep paralysis, altered states of consciousness, dreaming, and associated ideas play at least a small part in the perceptions. Second to a bedroom, the most common setting for the true tales is an isolated road or highway. It's hard to find an obvious reason for this, unlike it is for the bedroom. Driving, especially alone at night on a longer trip, can be hypnotic, meditative, and engage an almost trancelike state, but it isn't akin to sleep paralysis or dreaming. Could this meditative driving state be responsible for the visions of weird creatures and seemingly impossible and perplexing scenarios described in the stories? Perhaps, but it gets complicated when reading the actual accounts, many of which don't include long journeys, a lone driver, nighttime hours, or any other things that might be associated with trance-inducement. Thinking about it, an isolated highway (during daylight, on a short journey, with three people present) was the setting for my own inexplicable vision—that of an unoccupied, flying helicopter tethered to a guardrail. I have often wondered how this experience might have been different if driving wasn't involved—that is, if we had stumbled upon it while hiking. Would our perspective have been so different that an explanation would have been immediate? Is there something about the physical perspective of being in a car traveling at an unnatural speed that inherently skews our perspective so much that regular objects and events are seen in ways that make them seem extraordinary? If this seems unlikely, consider the experience you've probably had of walking along a route in a town or neighborhood you normally only see by car. If you have ever experienced this, you know how entirely different the scenery seems—it's almost a different place. Viewing things from a car changes our perceptions hugely, for whatever reasons. Perhaps this idea, along with the symbolism of the highway itself and our collective relationship with it just makes it a ripe place for mysterious experiences.